Rangers chief executive Graham Wallace has hinted that he might not receive his full bonus, which has been criticised by some of the club's fans. Wallace is on a salary of £315,000, which comes with a 100% bonus, with the Scottish League One champions. That came under scrutiny during an online question and answer session. "Any bonus that I may be awarded would be discretionary, based on a mix of company and personal performance," he told Rangers fans. "This would be determined by the remuneration committee and any bonus for this year would only reflect the time I've been here." The former Manchester City chief operating executive arrived at Ibrox in November and recently completed a review of Rangers' finances that outlined a cash burn of £70m over the last two years. 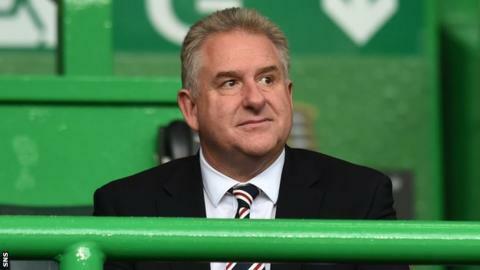 Wallace's business review document admitted there would be a "small number" of redundancies among Ibrox workers, but now he has suggested some of those affected may be given a reprieve. "We are restructuring areas to better position us for future growth," he insisted during the question and answer session hosted on the club's official Twitter page. "As part of this, a small number of roles may be affected. "We are working with everyone potentially impacted to identify if there are any potential alternatives for them." Wallace also denied pointing the finger of blame at supporters for the withdrawal of credit card facilities for season tickets. That came after the firm processing the payments, First Data, demanded security over Ibrox Stadium - a request Rangers rejected. Wallace had claimed the firm's demand had been sparked by uncertainty over season-ticket sales following threats by fans to withhold their fees. However, he told supporters: "Just to be clear, fans were not blamed for the withdrawal of the credit card facility. "The review said that negative comment in the media was a factor in the club's credit card provider seeking security over Ibrox." Reports this week suggested that as few as 2,000 of the club's 35,000 season ticket holders have renewed for next season. Wallace admitted sales were "slow" but said it was "understandable given the assurance fans have sought about the stability of the club. "Sales are gathering momentum now, as you would expect with the 16 May deadline approaching."